Named after my late mother, Marilyn was born in 2005 as soon as her 8″ BVC mirror blank was finished with a 1/7th wave, F4.2 parabola around Christmas of that year. At the time, I was into Astrophotography and I wanted a telescope that was quick to setup and enjoy while I was taking photographs. Little did I know that this telescope was to launch me on a passion (sickness?) that I still enjoy today. While I was working on the mirror, I started to think about how I wanted to build the telescope. I saw various examples online of folks making ballscopes and I liked that it was a different design than other scopes you see. 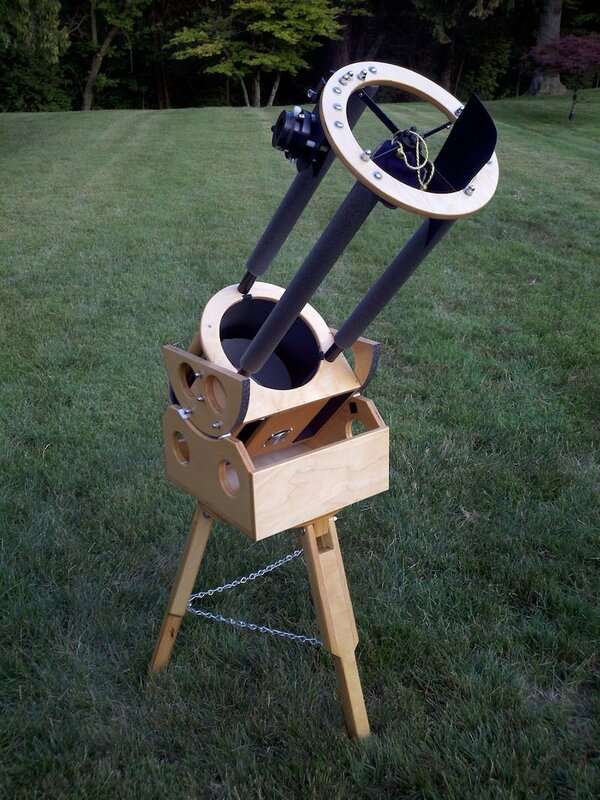 So I proceeded to build my first telescope: Marilyn Mark I.
I used wood dowels for the struts, and baltic birch plywood for the components. For the ball itself, I used a clear acrylic light fixture from an online retailer that I painted black on the inside. I found the hard plastic of a 5″ bucket to use as the bearing surface. It worked pretty well, but as my late telescope making mentor, Ron Ravneberg, used to say, “A telescope you make is never really done.” Little did I know then, that statement is so very true. During the winter of 2006, I accidentally poked a hole in the ball because Acrylic is brittle at cold temperatures. So I replaced the acrylic ball with a clear polycarbonate one and painted it a cool speckle finish. I also replaced the struts with aluminum. I found that leaning over the scope (it was pretty low to the ground) to be inconvenient to a healthy back so I made an adapter to attach it to a Meade field tripod to bring the telescope up to eye level. Marilyn Mark II. 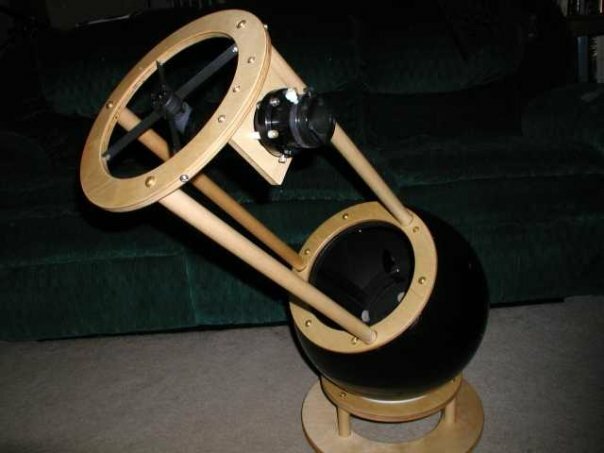 By this time, I finished a 12″ mirror and I built a ballscope out of that one too. I learned a great deal from the 12″ build like better ways to make components and a collimation system that is adjusted from the top. I painted the scope components black and used a white polycarbonate sphere to give it a nice clean look. I proceeded to rebuild Marilyn based on what I learned from the 12″ ballscope. Marilyn Mk III. Ballscopes have advantages over conventional dobsonians, but I soon found out the disadvantages caused me problems. For one, the center of rotation is fixed at the center of the sphere. This does not move at all. So the challenge is to get the balance point at the same place as the center of rotation. With a dobsonian, you can adjust this by where you place your bearings (and also how big they are in radius). 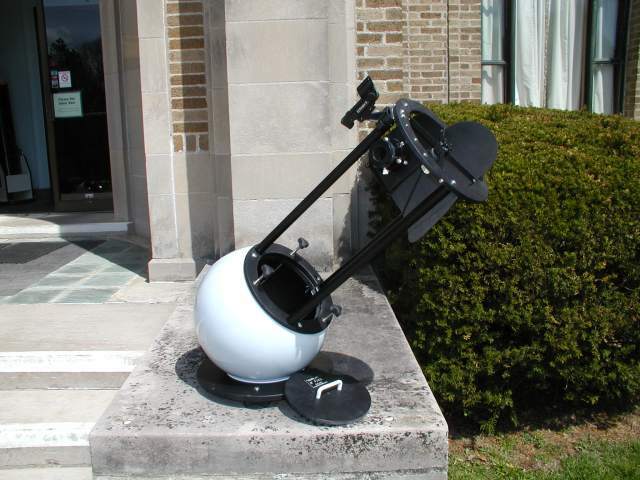 With a dobsonian, you can add weight to the bottom end of the scope to counter balance the top of the scope easily. With a ballscope, it is difficult to do this inside of the sphere. You only have so much room to work with. Also, if the sphere is distorted in anyway, a smooth action would be hard to achieve because the scope would rock on two points. 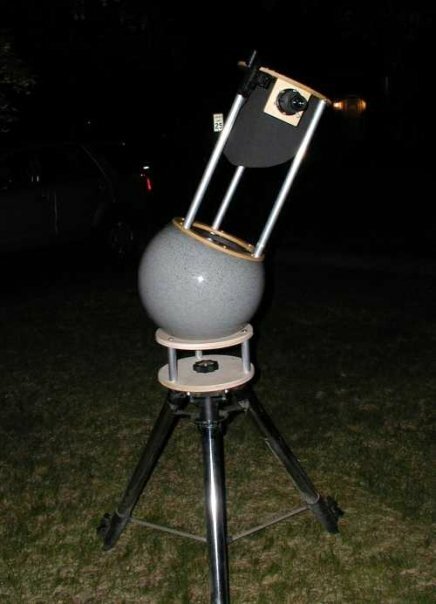 By this time, I rebuilt the 12″ scope to be more of a conventional dobsonian, followed by a 16″ scope. I decided to make the 8″ to be similar using the leftover wood from the 16″ scope. Marilyn Mark IV. Marilyn’s final version seems to be the best one. I enjoy using it a great deal. I don’t think I will modify it anymore. Or will I?